Where do you find Bass? 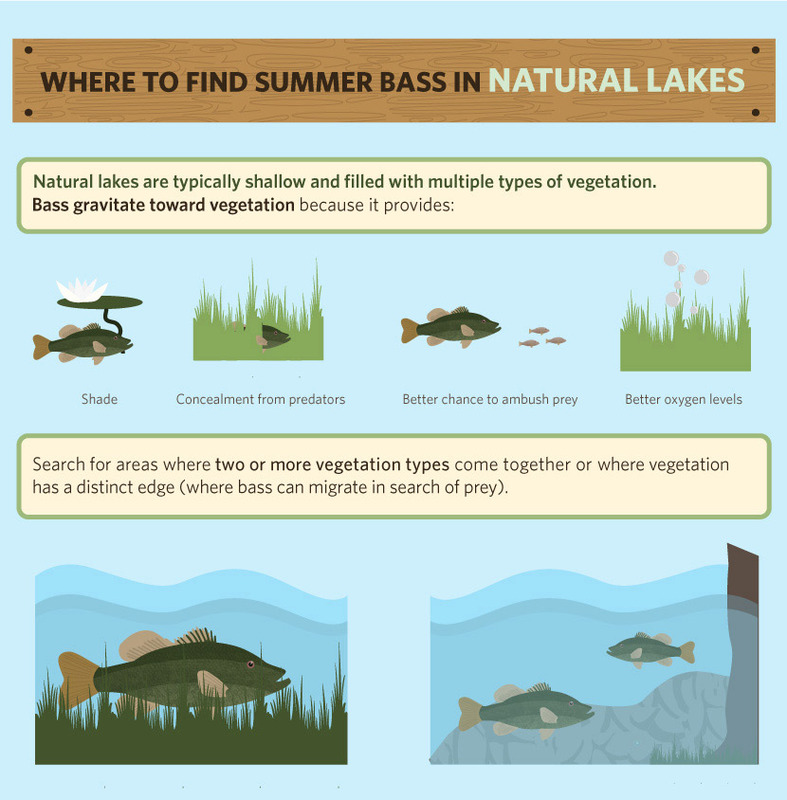 To locate summer bass, you need to determine a lake’s composition. Separate lakes into two basic categories – reservoirs or natural lakes – to establish the places largemouth bass call home during the warm water months. Man-made reservoirs present different options than natural lakes. However, a bass requires certain core items to survive: shelter, food, and oxygen. 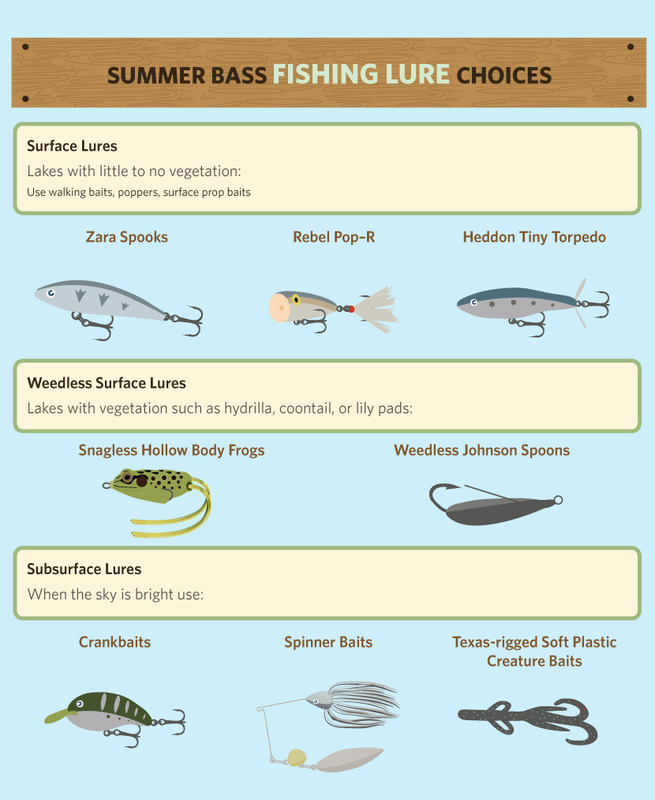 Regardless of the lake composition, bass will seek these items. Understanding the lake composition from the start helps anglers determine where to locate bass. 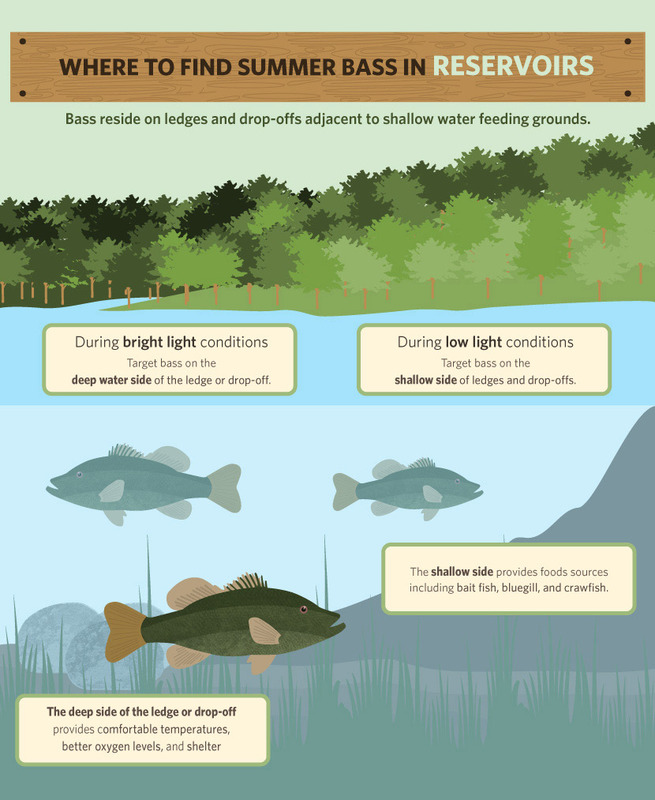 In most reservoirs, bass reside on ledges and drop-offs adjacent to shallow-water feeding grounds. They travel along these areas in search of food. On the deep side of the ledge or drop-off, bass experience comfortable temperatures and better oxygen levels. The depth provides shelter while the shallow side provides food sources such as bait fish, bluegill, and crawfish. To determine where to start your search, look for ledges and drop-offs with a significant edge. The faster the drop from shallow feeding grounds to deep water, the more comfortable a bass feels in its environment. During low light conditions (typically early and late in the day), anglers should target bass on the shallow side of ledges and drop-offs. However, with significant cloud cover, bass may stay on the shallow side for most of the day. When cloud cover prevents bright sunlight, many anglers fail to capitalize on shallow-feeding bass during the mid-day hours, so savvy anglers may have these bass all to themselves. In bright, sunny conditions, lures presented to the deep-water side of the ledge or drop-off will be more productive. Typically, natural lakes are shallow and filled with multiple types of vegetation. Bass enjoy this vegetation for several reasons. Because natural lakes rarely have deep-water sanctuaries, vegetation provides shade and concealment from predators and a better chance to ambush prey. In addition, shallow lakes get very warm in the summer heat, which depletes the oxygen content of the water. Bass seek out vegetation because it generates oxygen. When fishing on natural lakes, anglers should search for significant amounts of vegetation. Look for places where two or more vegetation types come together or where vegetation has a distinct edge, which creates the travel routes necessary for bass to migrate in search of prey. Just as in reservoirs, bass relate to fast edges – the more significant the change in type or thickness of vegetation, the more productive. In both natural lakes and reservoirs, vegetation can create very thick walls that provide a transition from feeding grounds to concealment. After a bass completes its feeding period, it moves inside the vegetation to conceal itself and benefit from the improved oxygen levels. Anglers should target bass early and late in the day with surface baits along these vegetation edges. As the sun brightens, anglers should switch to baits that can fall through the vegetation. The goal is for bait to reach the bass resting near the bottom as it waits for the next feeding opportunity. Figuring out what bass prey on during summer months is pretty simple. As with most creatures, Mother Nature takes care of things. For largemouth bass, the case is no different. Before summer, bass are only concerned with one thing: reproduction. For the six to eight weeks prior to summer, bass build nests, seek mates, mate, and then protect their young. During this time, bass feed very little and become thin and weak. In fact, many bass do not survive spawning rituals. At the beginning of summer, several species of shad begin to spawn. Spawning shad are oblivious to the world and water around them, becoming easy targets for hungry, tired bass. When water temperatures stabilize in the low to mid-70s, shad will move to shallow waters to spawn. To find shad spawning areas, be on the lake at daybreak. Most shad spawn within the first two hours each morning. Reservoir bass move along shallow ledges to feed on the shad and then retreat to deep water for shelter. In natural lakes, bass will also seek out spawning grounds to feed. If there is enough vegetation to sustain shelter, they will move into it and wait for the next feeding opportunity. The shad spawning season may last for several weeks, and it is long enough to strengthen bass after their own spawning season. An angler that finds these shad spawning locations has also found bass feeding grounds. Locating shad spawning grounds is not difficult. Shad will spawn just about anywhere. Using hard surfaces like rocks, timber, or any man-made structure (such as docks), shad will group up in pods of two to 20. These groups will circle hard objects, then lay eggs and milt that attaches to the surfaces. Bass know these shad are easy to catch and seek them out every morning until the shad-spawning season is over. During the shad-spawning season, the majority of bass already live in shallow water because they just finished their own mating rituals. The shad move to shallow water when they spawn, which reduces the effort the weak bass have to exert. Bass that have already spawned generally move to slightly steeper banks or vertical cover. This vertical cover can be anything from flooded timber to man-made structures, such as docks. Shad will also use these vertical objects to spawn, so bass will stake them out. Next up on the bass’s menu are bluegill and bream (also known as sunfish). As the summer gets into full swing, most species of sunfish start to spawn. Sunfish spawn in the same locations as bass. When the shad spawn ends, summer bass begin to feed on spawning sunfish. Bass feed on sunfish throughout this spawning cycle because sunfish drop their guard while actively spawning. As their spawning cycle comes to an end, the absent-minded sunfish are tired and weak, which makes them easy prey for bass. Seek out spawning sunfish to find an exceptionally large summer bass. Finding sunfish beds are extremely easy. Scan the bank lines between one and five feet of water. Look for several clear spots about the size of a butter dish lid. Typically, sunfish spawn in groups of 10 to 20. Each will have a bed (clear spot). All these spots will be next to each other in a small area about 10 square feet. Bass will prowl the outside edges of these spawning grounds, watching for stragglers that can be easily picked off. Summer bass fishing is exciting and simple. Once an angler knows where to locate bass and what baits to present, catching them is just a matter of getting on the water and casting. Just like selling or buying a house, “location, location, location” is the most important factor in summer bass fishing. Because bass’s metabolisms are high, they will strike anything that looks alive. We’ve discussed some lure options, but confidence goes a long way in bass fishing. If you have a favorite lure, don’t be afraid to use it when in the proper location. When fishing on natural lakes, anglers should search for significant amounts of vegetation. Look for places where two or more vegetation types come together or where vegetation has a distinct edge, which creates the travel routes necessary for bass to migrate in search of prey.